Okay, so I didn't quite get around to posting the next day, haha. More like two weeks later almost? Oops. Nova is.. quite a handful. Now I am getting ready to go on vacation! It is 5:20 in the morning and I am still up, packing and cleaning and making preparations for leaving all of my animals - and my blog! I am going to set up some posts to automatically post while I am gone. I am going to try to start making a habit of auto-posting, setting up posts on the weekends to post throughout the following week. I think that will help ensure no more of these lags when life gets too busy! Also, thank you all so much for entering the Zoya giveaway! I was hoping to have time to get through the entries and pick the winner before I left but unfortunately it looks like it will have to wait, so the winner will be picked the first week of June. Now, on to the polish! 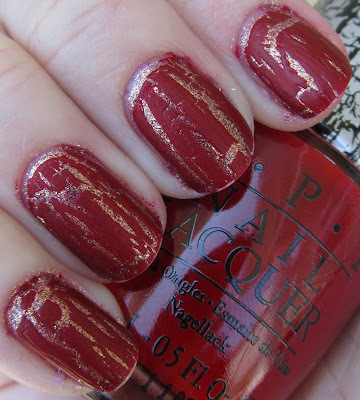 Today I want to share with you OPI's second recently released Serena combo, Rally Pretty Pink and Red Shatter! 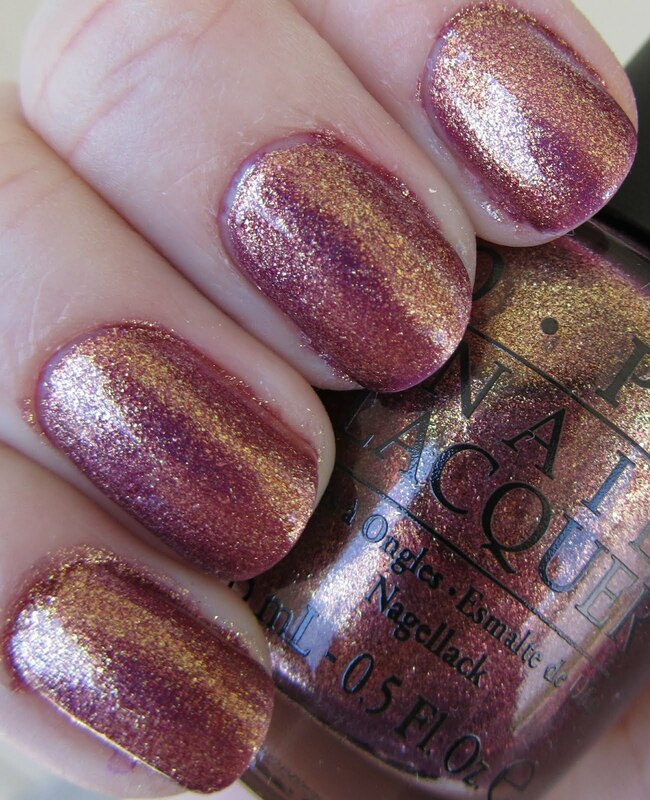 Rosy pink packed with gold flecks, giving this a gorgeous duochrome aspect! I love this color a lot. 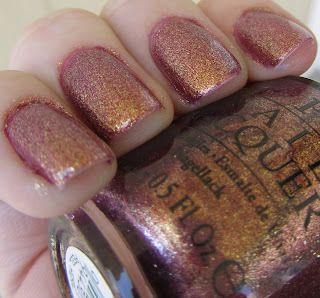 Similar to how I loved another color that was recently released... maybe from Zoya? If you are looking at this and thinking "Zoya Faye," I have to agree that they are similar. But that doesn't make the polish any less stunning. This was three coats for full coverage and applied very nicely! Packaged with Rally Pretty Pink was Red Shatter, which is an almost jelly-like shatter polish with a satin finish. I'm not entirely sure how I feel about this combo. 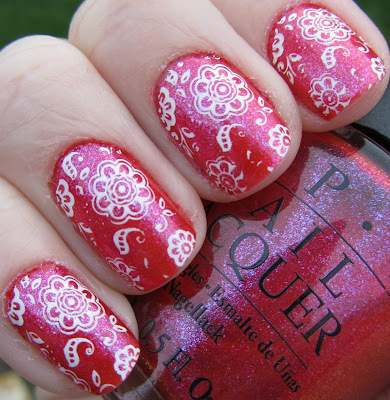 On the one hand it is kind of nice, but I feel like there are many other polishes I would like better under Red Shatter. I kind of oscillate between loving this and hating it. However I really like each of the two polishes on their own! Just not completely sure how I feel about the combo. Overall two very nice polishes. What do you think of the combination? If you could pick what would you pair with either of these? Vote for my adorable niece - EXTRA GIVEAWAY ENTRIES! Okay I admit I won't normally do this sort of thing, but since she is just so darned cute, I am going to ask you all to go vote for my niece in the cute kid contest! I am really not sure if there is any way to verify these entries (I will try to figure that out), however I will give you an extra giveaway entry for every vote you give Evie! You can vote once per day and I believe this goes until May 15th? If you vote for her, please leave a comment below. You must already be registered in my giveaway to receive extra entries! If you are not you can do so by clicking on the picture at the top of the left sidebar. This glitter bomb is packed with both silver and gold glitter in various shapes and sizes, giving this an amazing effect. 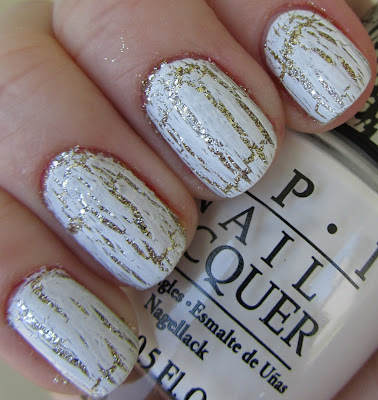 I wore this for a full manicure for several days and I have to say, I felt like I had jewel encrusted nails! 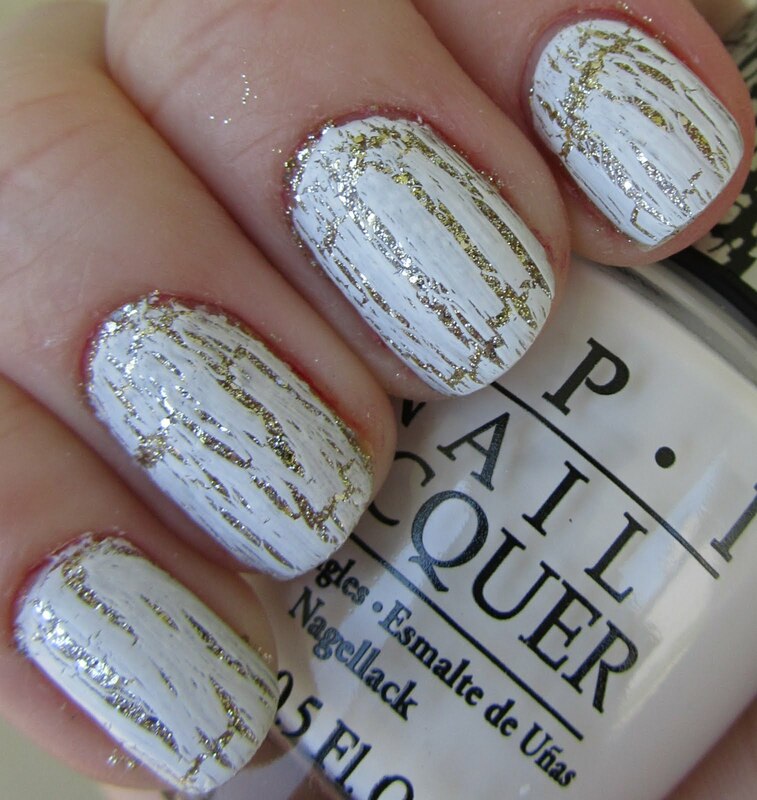 The overall effect of the gold and silver combination is more of a neutral champagne color, very classy. I got quite a lot of compliments on this one! Application was typical for a dense glitter - quick to dry, but you can accidentally push the glitter around if you don't give it enough time in between coats. Dries with a bit of a gritty surface but a layer or two of top coat should take care of that if it bothers you. Removal was a bit of a pain, as it is with all dense glitters - I highly recommend the foil method! Now on to the shatter combination! Spark de Triomphe is paired with White Shatter. I feel like the colors do go together rather nicely, however it's a bit sad to cover up the amazingness that is Spark de Triomphe. A nice combination, but I have a feeling I will be much more likely to use White Shatter over something else, and let Spark de Triomphe stand alone as a polish. Overall Review: Spark de Triomphe is a must have, and White Shatter is a great basic shatter color to add to your collection if you like the shatter look. I would definitely recommend picking this one up! 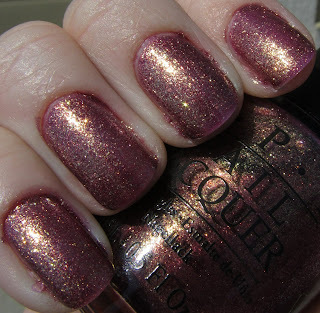 Here is one of those polishes that I have always looked at and wanted to buy, but for some reason never got around to it. Now both of my sisters have this one - but not me! I decided it was high time I tried this on, so I borrowed Becky's, and I was definitely not disappointed! 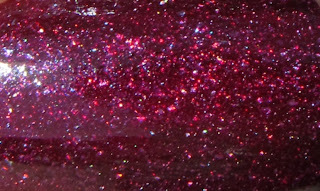 This is two coats of OPI DS Extravagance (perfectly named), a rich magenta full of gorgeous pink and holo glitter. This polish seems to glow from within, and there is so much depth to it - these pictures cannot quite do it justice! This one is alive. 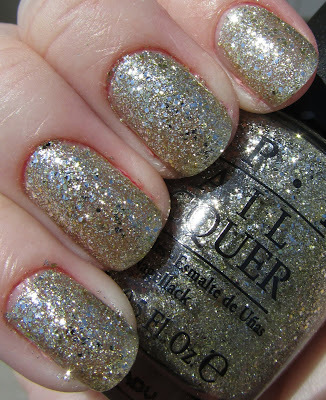 While it does lose some of its yummy holo shine outside of direct light, it is still gorgeous in the shade as well. I must admit, I tried to steal Becky's bottle one or two times. I am rather in love with this polish! I may have to borrow it often - or finally get around to buying my own bottle! This has got to be one of my all time favorite polishes... and on an interesting side note, this is the exact same manicure that was my very first Konad! I was wearing this polish on the day that I bought my first Konad set at the mall and did this design as my first ever Konad experience... it was definitely time to recreate this one! This is three coats of OPI Wing It! from the Summer Flutter 2010 collection. 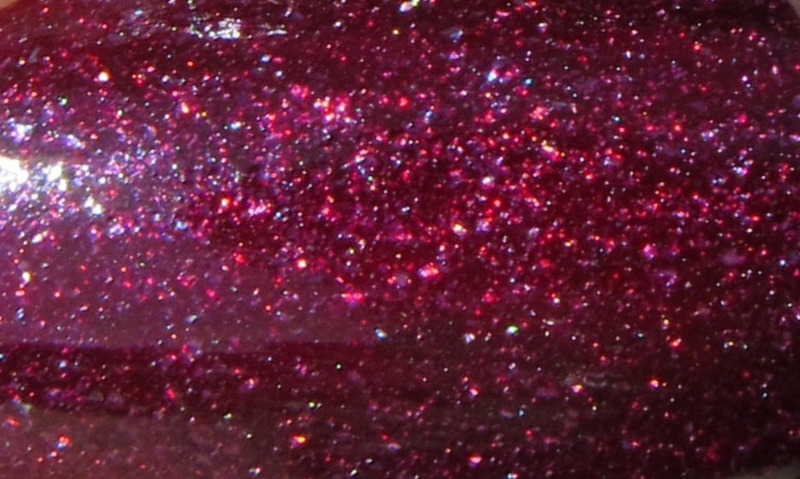 This is a stunning deep pink/reddish jelly polish packed with blueish purple flecks that give it a duochrome like appearance. It is a bit on the thin side - this is three coats and there is just a touch of VNL, but it is so gorgeous I really could care less! 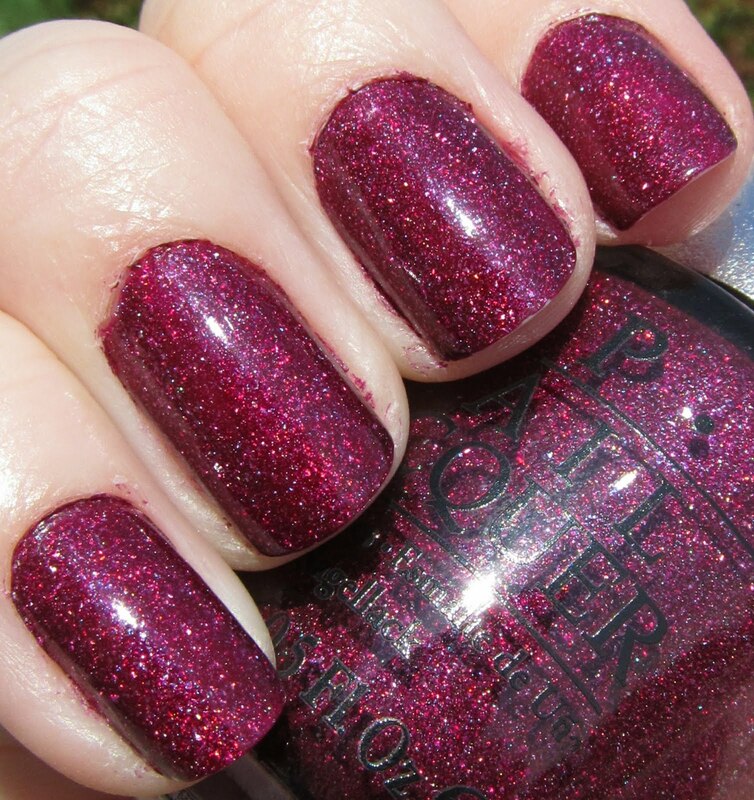 You can really see that purple in the bottle there, but it is also very apparent on the nails. 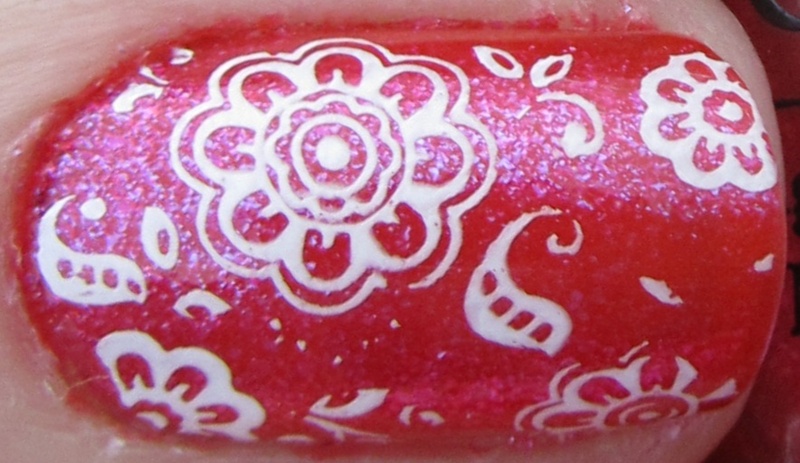 The pattern on this one is one of my favorites, the flowers from Konad plate m64 in Konad Special White polish. I think the white looks really nice against that fuchsia background. I still love this mani just as much as that first day I bought Konad!